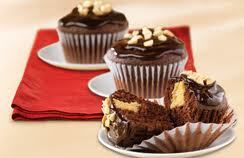 This wonderfully delicious cupcake combines two of my favorites, chocolate and peanut butter! Who doesn’t love chocolate and peanut butter??!! 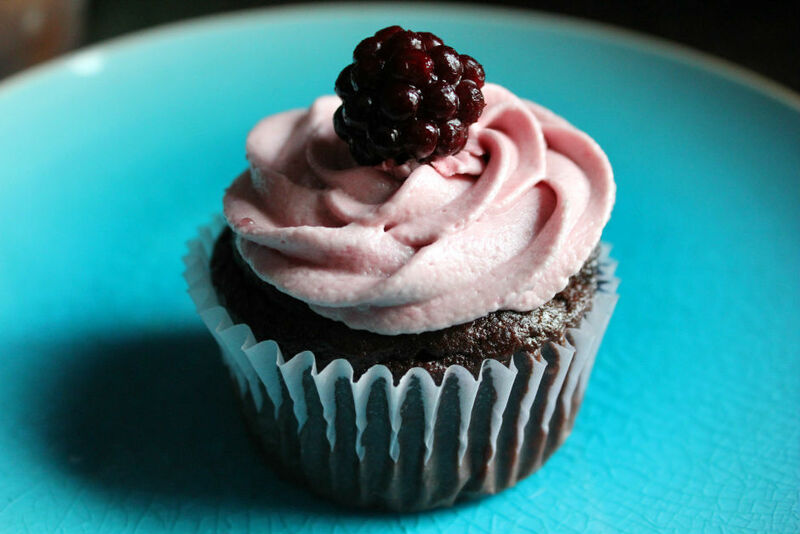 This cupcake looks beautiful and appears to be time-consuming, but it’s very easy. I made these for a friends daughters birthday and they just loved them. 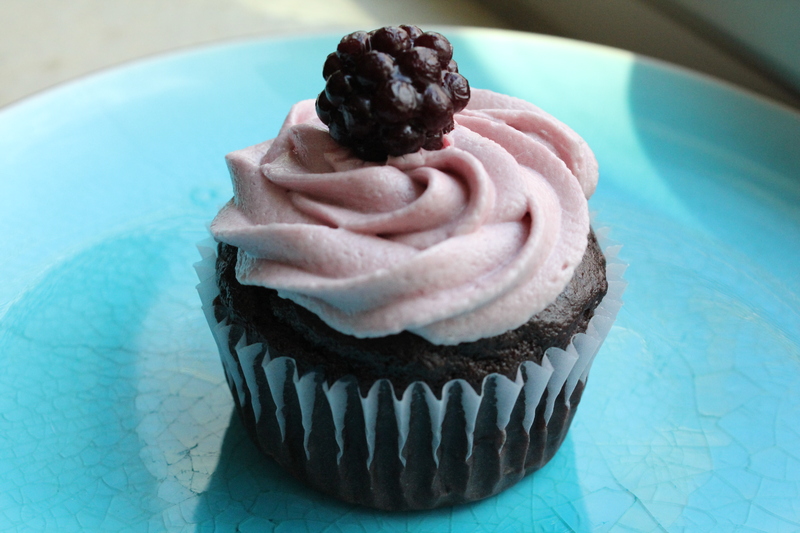 Whether you are making these cupcakes for yourself or someone else, they are sure to be enjoyed! Pour milk into a medium bowl. Add dry pudding mix. Beat with a wire whisk 2 minutes or until well blended. Add peanut butter; beat well. Spoon into a small freezer resealable plastic bag or pastry bag; seal bag. (If using a plastic bag, snip off one of the corners from bottom of bag.) Insert tip of bag into each cupcake; pipe in about 1 Tablespoon of the filling. Microwave whipped topping and chocolate in a small microwaveable bowl on HIGH 1 1/2 minutes or until chocolate is completely melted and mixture is well blended, stirring after 1 minute. Dip the top of each cupcake into glaze. Sprinkle evenly with peanuts. Store in refrigerator. 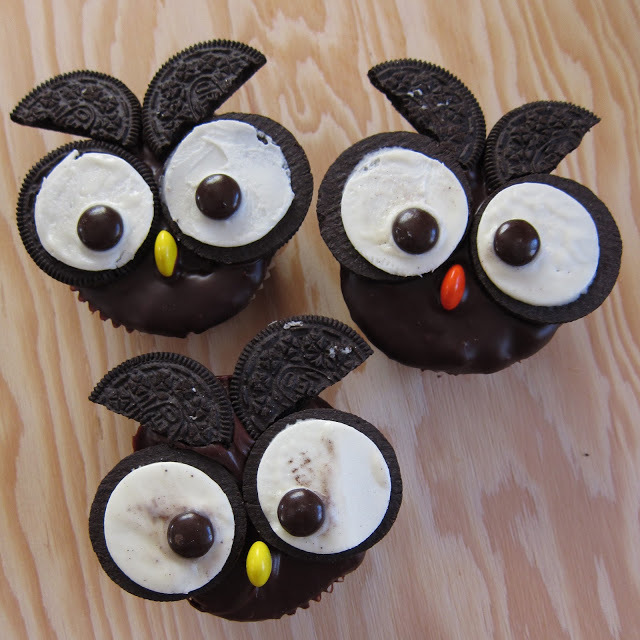 These cupcakes are so easy to make and they are adorable when done! Preheat oven to 350 degrees. Make cupcakes according to box. Bake for 18- 20 mins. While cooling prepare the ganache. Heat Cream and Chocolate on medium/low heat, stirring constantly, until melted. Add corn syrup. Let cool 10 minutes. First dip cupcakes into ganache, let set. Then divide 24 Oreos in 1/2, try to get all the cream off of one side (easier said than done). Cut 12 Oreaos in 1/2 for tufts. Place a brown M&M in center of white part of Oreo for “eye”. Place Oreo with eyes just below center of cupcake. Place tufts (1/2 Oreo) above eyes. Add a sideways orange or yellow M&M for nose. Store tightly covered for up to 3 days. 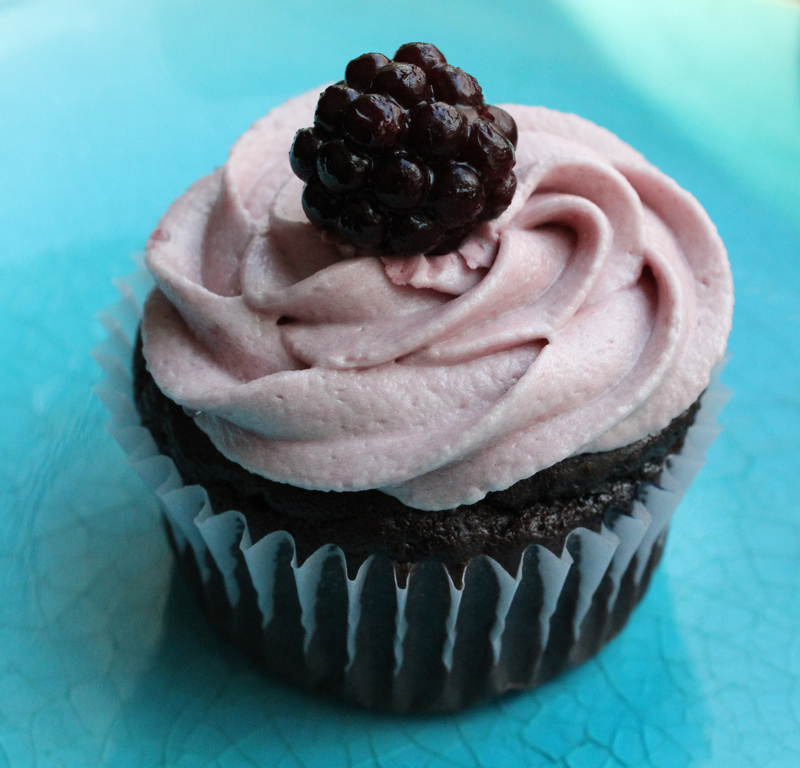 Beautiful cupcake…and delicious too! Another must try!! !